Dagger has been corrupted by Nights darkness. 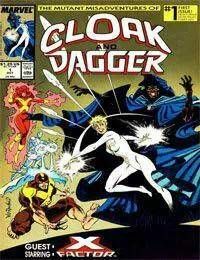 She is facing off against Jean Grey, Iceman and Beast of X-Factor while Night watches. Meanwhile, Cloak is trapped in the basement of the Plotnick Family of Fernwood, Ohio. Cloak is eventually released. He is able to free Dagger of the corruption. However, this comes with strings attached.